"When they call the roll in the Senate, the Senators do not know whether to answer 'Present' or 'Not guilty.'" As a lot of hardware enthusiasts know, major video card companies try and stick to a six month cycle. They release a new product every six months. The first cycle for this year was some where between December 1999 and January 2000. As most of you know, 3Dfx missed that cycle. 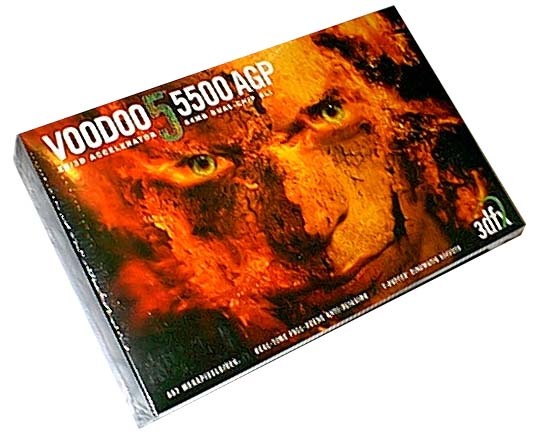 Instead, on 15 November, 1999 they announced the VSA-100 chip and the Voodoo 4/5 line of video cards. In June of 2000, they were finally (readily) available on shelves. 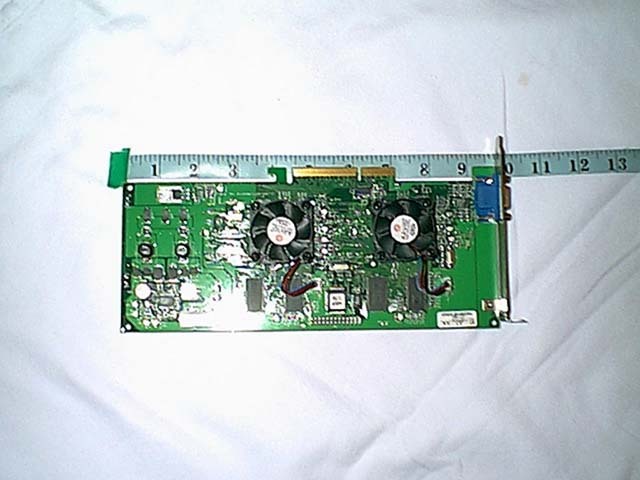 The question is: what does 3dfx have to show for all that time used to develop their newest card? Installation was a snap! Just as easy to install as a GeForce or Voodoo3 3000 or anyother card for that matter. They only real difference is that you need to make sure you plugged the molex power connector into the card. There is a Y-adapter included to make this as painless as possible. Pluggin in the power is pretty important as they have a warning sticker that you have to pull to get to the card. On that sticker it plainly states that the card will not work without the power. You need to remember, installation was a snap, for me. You need to remember that this card is 10 inches long. You might not have enough room in your case. If you do buy a Voodoo5, remember to check for space. The software end of the installation was just as smooth as the hardware install. After I installed the drivers and the 3dfx tools, all I had to do was a quick reboot and I was on my way. After restarting the computer, I noticed a little 3dfx logo in my system tray. By double clicking that, it gives me quick access to the advanced display properties for the Voodoo5. There, I adjust the FSAA setttings in OpenGL/Glide and/or Direct 3D. You have the option to turn off FSAA all together, set it to 2x FSAA, set it to 4x FSAA, or change it to single chip only (turning "off" one of the two chips). 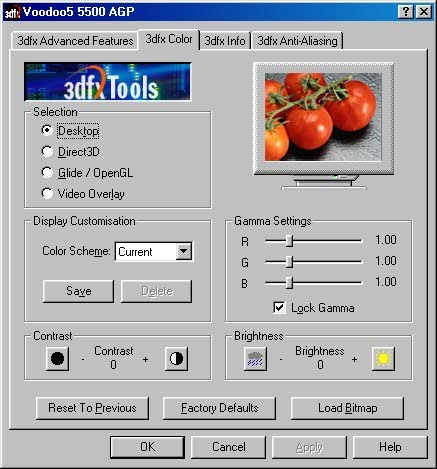 In the 3dfx advanced menu you can also adjust color settings and view driver information amoung other things. All in all, I would have to say the installation and setup of this card was easy and very efficent. However, the software package offered was horrible. On the installation CD you're given the chance to install a program called 3Deep and that's it, basically. I tried to use 3Deep and it seemed pretty worthless. I then uninstalled it and decided that if you're buying your video card for the software package, look somewhere else. Copyright © 1999 - 2019 Xtreme Tek. All rights reserved.